The secret is out … dry fire training is critical for any serious shooter. The industry has more options than ever before for both laser inserts/cartridges as well as laser training guns. Today I set out to compare the LaserLyte series of Laser Training Pistols and the Next Level Training series of SIRT Training Pistols. For Glock or M&P shooters you can get a training pistol that is molded exactly after your gun. Use your same holster and other accessories. The pocket pistol is comparable to the Glock 43 or M&P Shield and the grip resembles a real single stack compact firearm vs the LaserLytle compact pistol which is awkwardly thin and doesn't feel like a real gun. In addition the SIRT Pocket pistol has an optional magazine/grip extension to help you make it as comparable to your actual gun as possible. Functional rail for mounting lights, lasers, or the MantisX. All SIRT pistols have a functional rail and that allows you to work with a lot of great accessories. Take up laser comes on all models of SIRTs. The take up laser comes on as you take up the slack in the pistol and is displayed below the point of impact. It's a great training tool. Different models available for green vs red lasers. The lower cost models come with red take up and red shot lasers but you can make for higher end models that have green lasers instead. Removable magazines on the full size models. Practicing reloads or malfunction clearing is much more realistic if you have a removable magazine. Realistic resetting trigger. The trigger is perfect on the SIRT pistols. Works with all laser training software and target systems. Also true of the LaserLyte but worth mentioning that the SIRT will work with LaserLyte targets. Comes sighted in out of the box. I have about 10 SIRT pistols and they are all flawless when it comes to the sights. Point of impact is perfect. The only option for a Revolver Laser Training Pistol. If you carry or use a revolver as your primary weapon then the LaserLyte Laser Revolver is your only training pistol option. The trigger mimics a double action long trigger press. The laser fires but doesn't remain on with each trigger press. This prevents the potential for a software training aid to think you have fired twice. Considerably less expensive. Depending on the models the LaserLyte pistols are probably $50 to $100 less expensive than the comparable SIRT. Works with all laser training software and target systems. Also true of the SIRT but worth pointing out. Adjustable laser for sighting in. It doesn't come perfectly accurate out of the box but you can make the necessary adjustments. 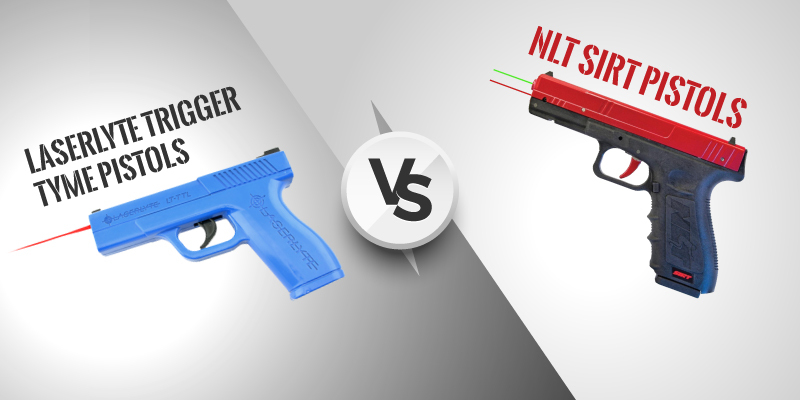 There you have it, a comparison between SIRT VS LaserLyte training pistols. Which one have you used and trust for your dry fire training? You are dry firing, right? Leave us a comment, below. Great comparison. Just what I was looking to know. I also was not too keen on the idea of the SIRT laser remaining on when the trigger is locked to the rear, but it might be a helpful for you to train getting off of the trigger and resetting it as soon as it breaks.